This is my second blog. My first undertaking can be found on myspace, in scattered vignettes spanning the past couple of years. It was fun. I don’t know if anyone outside my immediate circle of friends and family ever read or understood it, but it was fun to write. With this, my Second Attempt (not to be mistaken with the Second Coming), I hope to write about my comic strip, Welcome to Falling Rock National Park. I’ve been cartooning since I was a kid. You could say that cartooning is a part of me, like an arm or a foot. Or an eyeball. 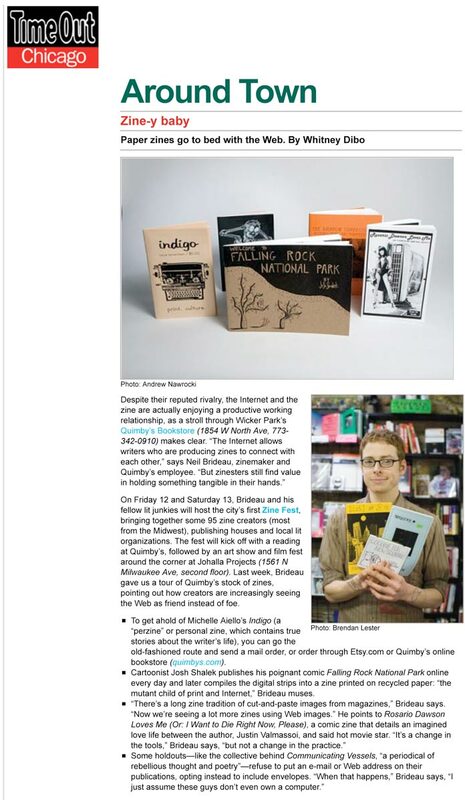 Falling Rock, my most recent comic strip, has been running in college newspapers for the past year. I like it. I like telling stories about these characters. The comic comes from growing up in the Sonoran Desert, going for hikes in the national parks of the Southwest, and liking to draw animals more than people. At the risk of starting my blog on a serious note, I’d like to speak for a moment about ART. Not Mr. Garfunkel, specifically. Generally. When I was a kid learning to draw from other people’s comics, I never really knew what the creative process was. I mean, I know what a duck looks like. I know a realistic drawing of a duck can be done by looking at the duck and drawing what you see. But I couldn’t figure out how Chuck Jones got Daffy Duck from a real duck. How many steps were there? Did he first master ducks, then distort the features? I didn’t know. Further complicating things was a man known only as Pablo Picasso. His drawings (and, okay, some pretty good paintings, too) were so far from “real.” How did he make the connection? I was also wondering, though I wouldn’t have put it to myself that way at the time, how I could look at one of his drawings and immediately understand it as a depiction of a real thing. 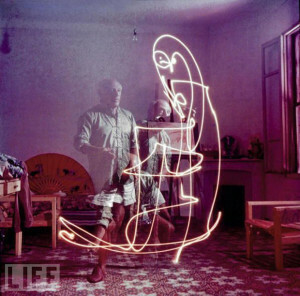 An answer came in the form of an old movie of Picasso drawing on a pane of glass. 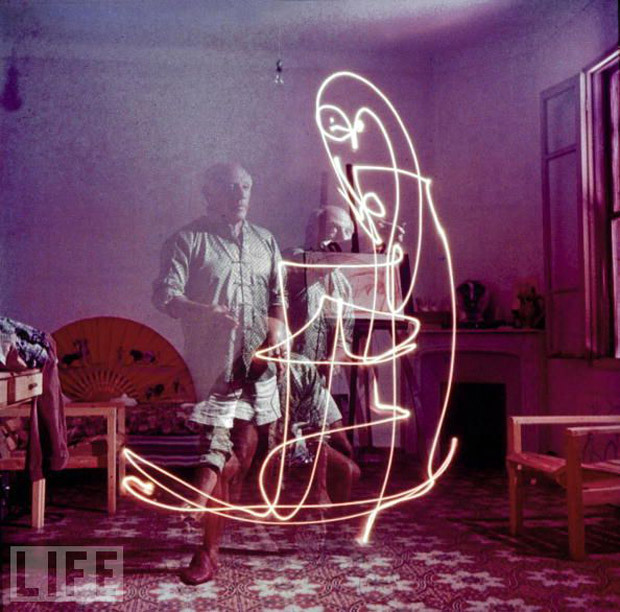 The camera was situated on one side of the glass, looking directly at Picasso. Picasso was looking at the camera. He then went on to draw on the glass. It was perfect! You got to see how he drew, without that annoying “over the shoulder” shot so common when showing cartoonists at the drawing board. And lo and behold, he drew a bull exactly the way he might have on one of his canvasses. He didn’t draw a regular bull, then draw his bull over it and erase the first bull. It was directly from his brain to the page (or, glass). When drawing something I haven’t drawn before, I still tend to make an attempt at realism first. I’ll draw the gecko as it looks in the photograph. Then I’ll start embellishing. Make the eyes bigger, the fingers more prominent. I’ll streamline things to make the whole picture more cartoony. And of course I have to start imagining the way it moves, to see it from different angles so I don’t end up drawing the same picture over and over. This last part has become much easier as the internet becomes faster and more image-heavy. Instead of having one reference picture, I can find five or ten fairly easily. There are lots of geckos on the internet. In this way, I think of drawing as a way to get from A to B, but B is an unknown destination. It is terrifying at first (some may say paralyzing), but as you become accustomed to not knowing where you’re headed, you start to like it. One other thing I got from that movie. 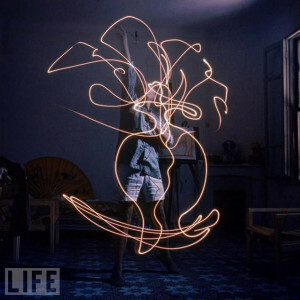 Picasso had obviously made a visual language for himself. It wasn’t a formula – that bull looked different every time. But it was a way for him to draw anything and still make it look like he drew it. I think that this is the ultimate goal for a cartoonist. To create a world that is unique yet recognizable, where everything fits together but doesn’t look cut from a mold. That is great cartooning. Raised eyebrows in FoxTrot. Literally, they rise about a foot over the head of the character. Calvin’s many, many facial expressions. A good example is the Sunday strip where he is having his picture taken. Take after classic take. Daffy Duck’s head after it is blown up/blown off/blacked out when he is shot by Elmer Fudd. Calvin’s dresser. Actually, anytime it is hinted that his room is messy. The abyss that Charlie Brown’s head becomes when he looks heavenward and moans. This can be seen when he is on the baseball field. Gary Larsen’s ‘stupid’ characters. The glasses, the teeth showing, everything about them reeks of stupid. The single line representing eyes in many of Gary Larsen’s animals. Tony Millionaire’s ships. Schooners, pirate vessels, tug boats…all of them. This is not particular to one artist: when an inanimate object is shown flying through the air with a shadow underneath it to indicate forward motion. Most often this is used with cars. I think they tried to replicate this motion in “The Blues Brothers” movie. When the Grinch smiles his horrible, evil smile. Decorations between the panels of a Krazy Kat comic. When Batman narrows his eyes in the Batman cartoon. When he does that, he really means business. The White House in Doonesbury. I would argue that the White House is a character in that comic strip, just like any of the humans. Robert Crumb’s telephone poles. I feel like they’re used as a symbol of urban decay. The dotted line in The Family Circus. Okay, just kidding. The dandelion field in Bloom County. This was off the top of my head. Maybe I’ll do a follow-up! Comic strip characters are known for their stability, and yet they are constantly changing.Calvin wears the same striped shirt every day; Snoopy sits on the same doghouse. But if you take examples from early in a strip’s run compared to years later, you’ll find striking differences. When first seen, Snoopy’s snout is much narrower than in later years. Calvin in 1985 is much more flat-looking than his 1995 counterpart. It takes a while for a cartoonist to get to know his or her characters. The characters look the way the cartoonist wants them to, but that vision is always being refined. I would call it a distillation, but cartoon characters are already distilled from real life. I’ll call it Super Concentration. 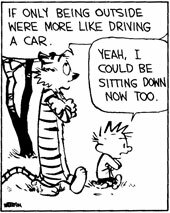 The 1995 Calvin (sounds like I’m describing a car model) is what Bill Watterson was aiming at all along. The interesting part is, I would say that the 1992 Calvin is what Bill Watterson was aiming at up to 1992, and the 1988 Calvin was what he was aiming at up to then as well. So, the most current drawing of the character is the most essential drawing done yet, only to be supplanted by the next drawing. At least, this is my theory. When I began drawing my characters for Welcome to Falling Rock National Park, they hardly resembled the characters they are today. Their personalities weren’t focused, and so my drawings really didn’t get to the essential Ernestoness of Ernesto. 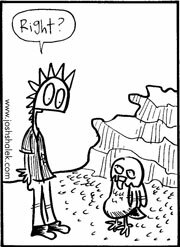 I did my first drawings a few years before I actually started the strip (I did a comic strip called The Family Monster for four years before I started Falling Rock in the Fall of 2006). Ernesto, in the beginning, had a differently-shaped head.His eyes were smaller, and his shoes were but little blobs at the end of his legs.I’ll be the first to admit that I’m still not happy with Ernesto’s shoes.It’s a work in progress.You can see the progression in the two pictures I’m posting; one from 2005 (from my sketchbook) and one from this year.Now that I’ve had time (and about 200 comics) to understand him better, I know more of the subtleties of Ernesto’s personalities. I can also draw him better. Every new batch of comics I draw, I feel it has improved on the last batch. I’m always trying to better my drawings, but when the characters look on the page closer to the way they look in my brain, I consider that a victory. Do all cartoonists see it this way? I imagine that for those who use assistants or have their kids carry on the strip, there is a push to keep a character’s look static, the same way a retiring CEO would want to see his company going down the same path he set out for it. It’s also easier to have character models (like they use in animation) when there is more than one set of hands at the drawing board. The less room for interpretation, the less chance of messing up a lucrative property. For those noble few who draw the same character day after day, decade after decade, I imagine there comes a point where they know what they want and exactly how to create it. For me, that time has not come. In some ways that is frustrating – I always want to make it look better! But I enjoy the process. In a couple of years, check back to my early Ernesto. I’m sure he will look strange to you. There’s an early Calvin and Hobbes Sunday strip – you may have seen this one, it has been bootlegged to death – where Calvin and Hobbes dance to a record. That’s right, a record. Not a CD. Not a cassette. Calvin places the record on the turntable. Now, most people still know what a record looks like, even if they personally have never owned one. The black wheel with colored cardboard in the center is something of an icon in popular culture. I even have CDs printed to look like records. But the fact of the matter is, that comic strip is already dated. For those whose first purchase of music came in the form of a cassette or CD, that small detail makes the comic different. Suddenly Calvin is not doing this now. He is of a certain time. It sets you back. It’s like watching a black and white movie. Instead of being totally absorbed in the story, you first take a step back. “I am watching a movie.” It isn’t a big step, but it does matter. And it changes the way you read the comic and relate to the characters. Cartoonists seem to fall into three general categories when it comes to this. There are the cartoonists, like Gary Larsen (The Far Side), Patrick McDonnell (Mutts), and Jim Davis (Garfield), who put their characters in a world that is out of time. There are few (if any) cultural references. A joke from the 80’s makes sense today: there is nothing topical about it. Second, there are the cartoonists who are all about current events. Bill Amend (FoxTrot) had Jason attending the current summer blockbuster every year. I remember when he attended Jurassic Park with a dinosaur mask stuck on backwards so he didn’t get to see any of the movie. Years later, he attended the first Star Wars prequel. I’m not counting editorial cartoonists here, just because they’re topical by nature. The third category are the cartoonists who try to be out of time, but draw the things of modern living. Phones will date your comic strip like nothing else. I can’t think of any comic strips that showed cell phones 15 years ago. Before that, there was the switch from rotary to touchtone telephones (rotary? touchtone? Man, I feel old even talking about this stuff). Cars change every ten years or so. There are lots of incidental props that cartoon characters use as part of a joke that no one will notice until years later. They’re invisible, in a way, until the passing of time makes it so, so obvious. I’m not saying this is a bad thing. Really, it’s inevitable if you’re going to set your comic strip in the real world. I mean, are you supposed to not use a phone, for fear it may detract from the joke 40 years from now? It’s just something I think about, when I’m drawing my comics. I’d love to draw a comic that takes place on Mars starring a bunch of weird-looking aliens. Those of you still reading this may be wondering: when will this end? Soon. You may also be wondering: which of these general and not-too-accurate categories would I, your blogging cartoonist, prefer to make my nest? Glad you asked. There is a reason I set Welcome to Falling Rock National Park in the middle of the desert. I won’t have to draw things like refrigerators, cars and phones. I’d rather draw trees and cacti and mountains; things that won’t change for another million years or so (another reason is that I just enjoy drawing nature more than human-made things, but that’s another topic). I hope that, if I’m still drawing Welcome to Falling Rock National Park years from now, I won’t have to look back on my early strips and wince at too many outdated references. I’m sure I’ll have a lot to wince at anyway, so one less winceable thing will give me peace of mind. Next time I need to draw a phone, I’ll try to draw one that looks like a Future Phone. That way I can cover all my bases. I would love to see a great adventure comic strip in the newspaper. I think it would be fun to do one myself. However, I don’t think it can happen unless a couple of fundamental things change in newspapers. I don’t think either of these will happen, but here’s my scenario anyway. First, an adventure strip needs more space than an average joke-based comic. Part of the fun of reading an adventure comic, like Tintin, is the art. Your characters can be anywhere. It’s like a James Bond movie without the crappy song at the beginning (except, of course, Live and Let Die). A few comic strips rely so heavily on dialogue that it literally reduces the characters to tiny floating heads in the corner of the panel. My advice is, run comics in different sizes. They already do this on Sundays, why not the rest of the week as well? I believe Stephan Pastis (Pearls Before Swine) made this argument in his comic: to prove his point, he reduced the final panel down to a fraction of its original size. It didn’t take anything away from the joke (although, I wouldn’t reduce the entire comic to that tiny scale: you’d need a magnifying glass to read the funnies. I’d say that reducing by half would still allow legibility while making more room for my AWESOME ADVENTURE STRIP). The second roadblock to SUPER FUN ADVENTURE is how comics are read. For an adventure to be successful, you need it to be accessible for new readers. I can’t stand discovering someone’s web comic only to search back months and years in their archive to figure out what’s going on, who these characters are, and why I should care. People don’t read comics on a daily basis, and I’ve been told you have to assume a new person will be reading every strip you draw. That’s tricky for ongoing stories, to say the least. My solutions follow. Make each adventure short. Two weeks, maybe three at most. Don’t introduce a whole lot of new characters. Have a recurring cast. Make something happen every day. It doesn’t have to be a major plot point, but each strip should have a mini-story. Make it well drawn. That sounds obvious, but I think if the drawing style catches the eye, people will linger for the extra couple of seconds to read the strip. Then they may read the next day’s installment. At the end of a storyline, publish it either online or as a pamphlet. If these sell well enough, you can publish a big book every couple of years. That way, you’ve got easy access to recent events in the story without having to go clicking around online to figure out why the helicopter turned out to be flown by the arch-nemesis, and why the mountain was really a secret fortress. Sure, there are restrictions. 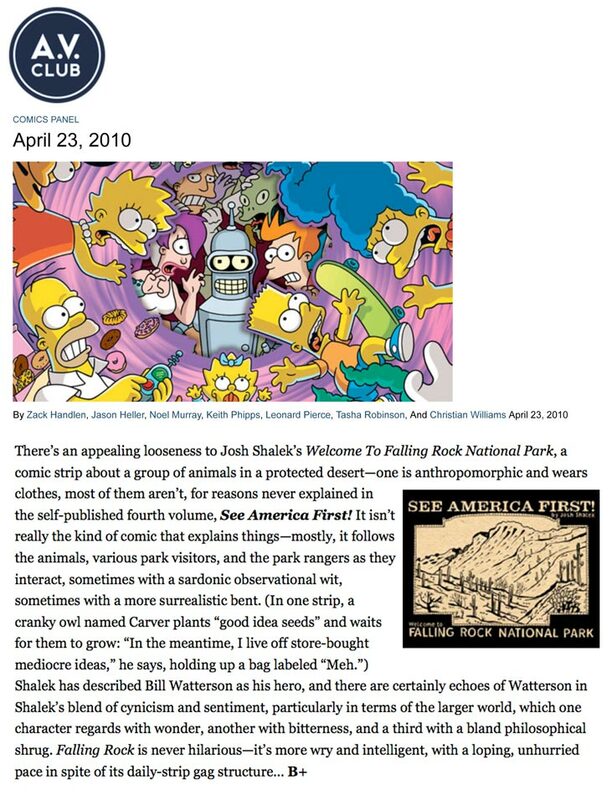 The cartoonist can’t just follow a story endlessly, and must find a way to link daily episodes to the larger picture. But I think the restrictions could prove useful. It won’t allow self-indulgent wallowing. It will also promote forward momentum in the comic. It will be exciting to read! because even the cartoonist may not know how it will end. So that’s my modest proposal. Who wants in? Edward Gorey. Gorey draws scary things, as well, but in a completely different way. If you’re curious, I am drawn to artists who can draw scary things with restraint. I don’t really go for the straight-up gorefest. It’s so obvious. To me, scary things are scary because they are hidden or implied. Such is the case with Edward Gorey He is almost British in his restraint. I was first introduced to Edward Gorey through his tiny book, The Gashlycrumb Tinies. It’s an alphabet book, and each letter is the first letter in the name of a child who has died in some novel manner. My favorite: N is for Neville, who dies of ennui. 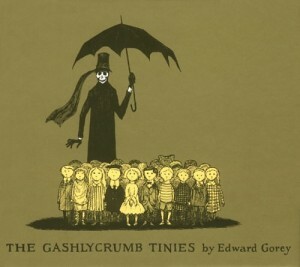 Gorey’s style has a delicate line quality. He draws very innocent-looking children, and his monsters are not always the meat-eating kind (see: The Doubtful Guest, about a terrible houseguest). He is very meticulous. His books are full of repeating patterns, primarily seen as wallpaper, or on the many knick-knacks inside the characters’ houses. His drawing style works perfectly for his often dark subject matter. He is humorous and scary simultaneously; his light touch makes his pairing work. Edward Gorey died a few years ago. I remember reading an interview with him, in which he expressed consternation that he couldn’t be more productive. He had written so many stories, but it was the art that took so long. Looking at his books, you can see why. There is such wonderful detail to be found in each panel. Glen Baxter. There might be a pattern emerging here. 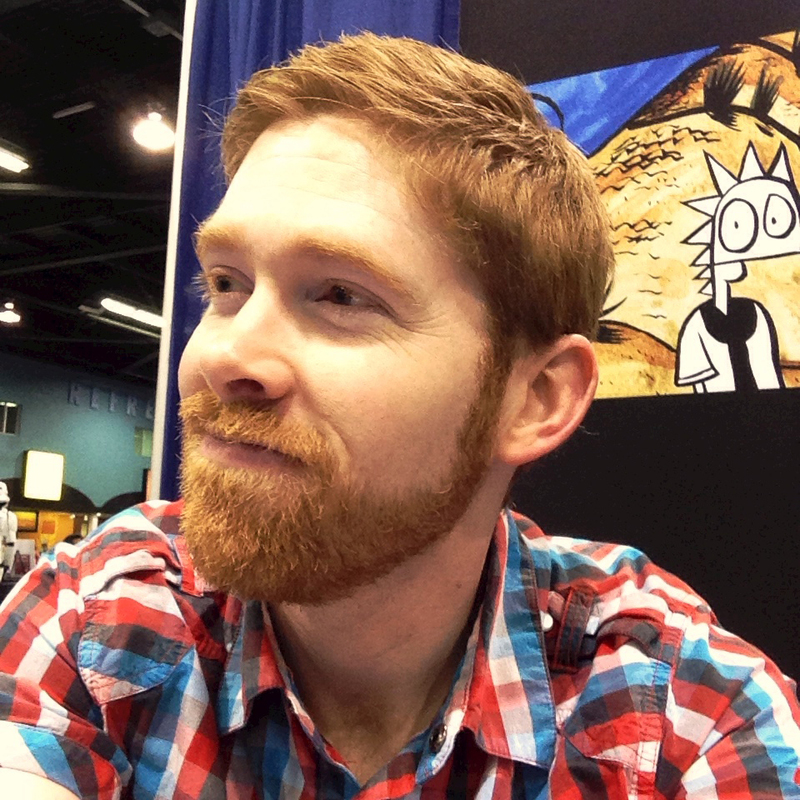 These three cartoonists all have a style that seems old fashioned in a way. They don’t look inspired by art from a generation ago – they look much older. In that sense, Glen Baxter has the most recent style so far. 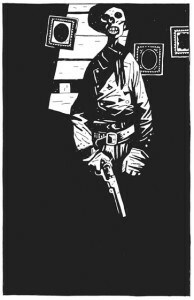 His drawings resemble classic Western comics from the 1940’s and 50’s, with maybe some 50’s magazine ads thrown in. There is no mistaking a Baxter comic. It is a bizarre juxtaposition of modern humor with that period drawing style. If humor is surprise, then Baxter has taken it to an extreme. Robert Crumb. The above three artists can draw anything in a specific, unique style. Crumb can draw anything, period. Everything is well drawn. He just lays down line after line, and it all works to make a picture. It’s expressive, three dimensional, balanced. I have to say that one of my favorite things about his style is the way he draws the detritus of modern life. Telephone poles, junked-out cars, overflowing garbage cans. He even seems to relish drawing the people who inhabit the messy world. Some of his comics seem to say that we live in a trashed world, and we ourselves have become a part of that rubbish. And yet, there isn’t a sense of judgment you would expect with such a statement (maybe because he includes himself in that statement – just look at the hilarious way in which he’s caricatured himself over the years). His stories are engaging, and a big part of that is the way he draws. 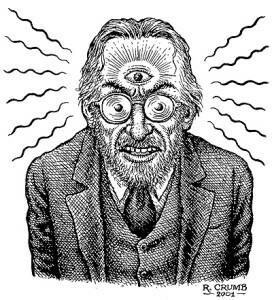 I’ve seen a lot of imitators of Crumb’s style, and I have to wonder why they would even try. What’s the use? It’s already being done so well. I only hope that I can draw as well as he does someday. Not in his style, of course; in my own way. Most Sunday funnies are now done on Photoshop. You can tell this most easily by the increasingly-used gradients for backgrounds and shading on the characters. Now don’t get me wrong: Photoshop is probably the greatest piece of software ever created. That being said, it takes some skill to make a comic not look like it was done on Photoshop. When people say a drawing has been “Photoshopped”, they don’t always mean that in a positive way. People will look back on the Sunday comics done now in the same way that we look at those done in the 50’s – there are the comics that show the limitations of the time, and those that strove to exceed them. It’s the same way with music. You can place an album by the way it sounds, by the recording quality, more easily than by the songs themselves. If an album sounds like it was done in the 80’s, with that awful reverb on the drums and the fake-sounding keyboards, it pulls me right out of the song. Same thing for a comic. I don’t want to be reminded of what program was used to color a comic strip; I just want the comic to look good. There are, as always, artists who apply their style to the medium, rather than the other way around. I read in Mutts: The Comic Art of Patrick McDonnell that Mr. McDonnell uses watercolor (or, at least he did at one point) to color his Sunday strips. 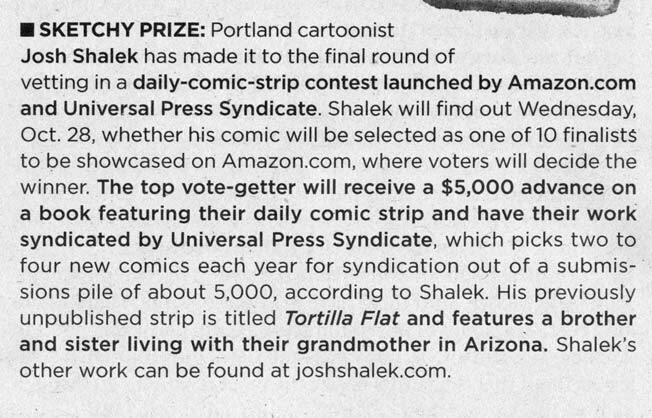 There was a reproduction of a strip ready to be sent to the printer which filled me with dread. Every color in the comic, no matter how small, was carefully marked with a number, the number corresponding to a color at the printing press. There were lines with numbers all around the strip. It looked like the strip had been attacked by spears. 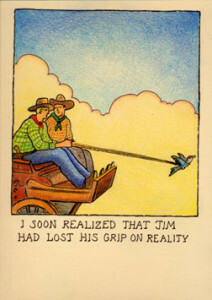 McDonnell worked with the limitations of the printing process and still managed to create a beautiful color comic strip. It required more effort than simply slapping a gradient across each panel, but it looked all the better for it. I really admire the color on a few comics: Bizarro, Funky, Mutts (as mentioned), and, of course, Calvin and Hobbes. I don’t often work with color on Falling Rock, mostly because I run in papers that don’t print their comics in color. When I do have occasion to use color, I try my hand at Photoshop. I can say from firsthand experience how hard it is to color a comic and make it not look like it was done by computer. There is always the temptation to use the abundant filters Photoshop offers. I discovered that you can use flat colors and it comes out fine. I now think of it as using – surprise – watercolor paints. Paint a color in, and if it needs something more, pick another color and paint over that. I use the “darken” and “lighten” features, which make the colors act more like watercolors and less like acrylics. I have to say that, although it’s a lot of work, coloring a comic is pretty fun. I especially like to see the finished product. Sometimes the colors add atmosphere to the drawing, giving it so much more depth than the black and white line drawing did.